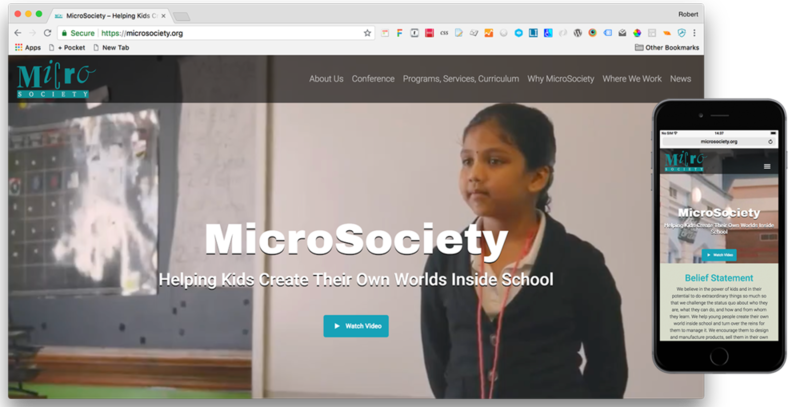 MicroSociety is a Philadelphia nonprofit with a long track record of enabling immersive experiential education in K-12 schools around the world. Their website grew over the years on typical shared hosting to include more than 20 plugins of varying quality, complexity, and security -- all integrated loosely into a commercial theme. This complexity resulted in difficulty in performing content updates, inconsistent branding, and compromised performance and security. MicroSociety needed access to its content and wanted to move to an easy-to-use content management system with a responsive front-end and reliable hosting that allowed for quick and easy content updates. AG Strategic offered to move MicroSociety to a standards-compliant framework, using Bootstrap 4 and the trusted Underscores WordPress template framework. Also, AG Strategic advocated for the state-of-the-art Pantheon.io managed hosting platform. On an interim basis, AG gained access to the production server and performed interim updates for security and stability while building out the new site on Pantheon. After a reskin and redesign, including crucial style and design changes needed by the client, AG thoroughly tested the new site in its new managed hosting platform. The new MicroSociety site incorporates an easily updatable theme framework on best-in-class managed hosting that loads many fewer plugins, resulting in greatly improved performance, brand consistency, and security. With 8 Nobel Prize winners in its rich history, Cold Spring Harbor Laboratory (CSHL) stands tall in the field of biological research and education, as the 125+ year old proving ground for innovative research and education programs that have fostered game-changing discoveries and advanced healthcare, modern agriculture, and environmental sustainability. In February 2017, CSHL asked AG Strategic Design to completely reimagine and rebuild CSHL's public facing website, elevating its web technology and presence to match the world-class status of this organization. 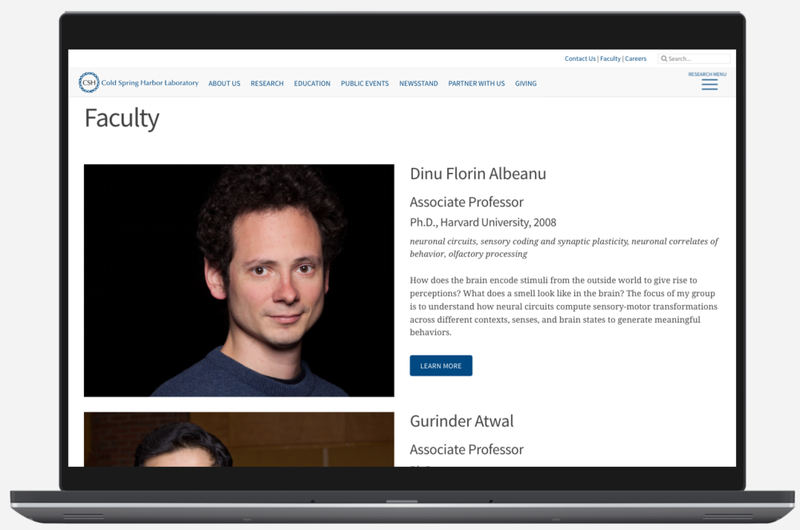 After working with CSHL's internal communications and technology teams for eight months, AG helped launch the new responsive site on the WordPress managed hosting platform Pantheon.io. Make the administrative back-end experience of managing the site as delightful as the front-end experience. CSHL is a dynamic institution on the leading-edge of cancer, neuroscience, plant biology and quantitative biology research. Home to a scientific community of 600, with a total of 1,000 faculty, students and employees, CSHL required a web presence that allowed them to focus on conveying their great breadth of work while eliminating any friction in delivering such related content to the web. Thus, AG focused on making the delivery and management of information about the institution's advances as easy as possible. From a technological standpoint, this made WordPress the ideal choice for a content management system. WordPress's strengths include a well-developed PHP-based core and user-friendly out-of-the-box admin panel. WordPress also remains flexible enough to serve as an enterprise level content management system that can be customized to any institution's needs. As such, this allowed for a highly collaborative and iterative custom design of both front-end and back-end features for the site. Further, we wanted CSHL's internal teams to be able to focus on creating and managing content instead of being bogged down managing the servers and codebase that hosted the site. To this end, we leveraged Pantheon.io's managed WordPress hosting platform. Under CSHL's previous content management system, whenever content creators wanted to refresh the design or, in some cases, even update copy, they had to make a change request to a back-end web development team. Frequently, the development team had to push the whole site again any time a change was made. This meant that both developers and content creators were unable to focus on tasks that benefitted the institution as a whole. Specifically, for content creators, this meant creating new compelling content that showcased the institutions achievements and, for the development team, this meant updating product features and making performance enhancements. Pantheon's managed hosting development, staging and production environments allowed us to separate code from content so that each unit could focus on its core competencies. With a fully responsive design, the site looks great on any device. Cross-promotion of various types of content where virtually any piece of content could be featured in other areas of the site at the click of a button with a customized WordPress administrative panel. What this equates to practically is a system that elegantly pulls together content and resources from all areas of the site and covers the breath of work of the institution in a very easy to administer way and, more importantly, compelling way. PolyCore Therapeutics is a pharmaceutical start-up specializing in Parkinson's disease and other central nervous system diseases. PolyCore approached AG Strategic with a request for a quick turn around for a public website to satisfy a very important need: the firm's co-founder was selected to present at a conference highlighting PolyCore's work in two weeks time. AG Strategic rolled out a responsive, Bootstrap-based site using managed hosting platform Pantheon. AG Strategic built a modern and compelling WordPress site using an agile development process to meet the deadline within one week from receipt of site content to launch. 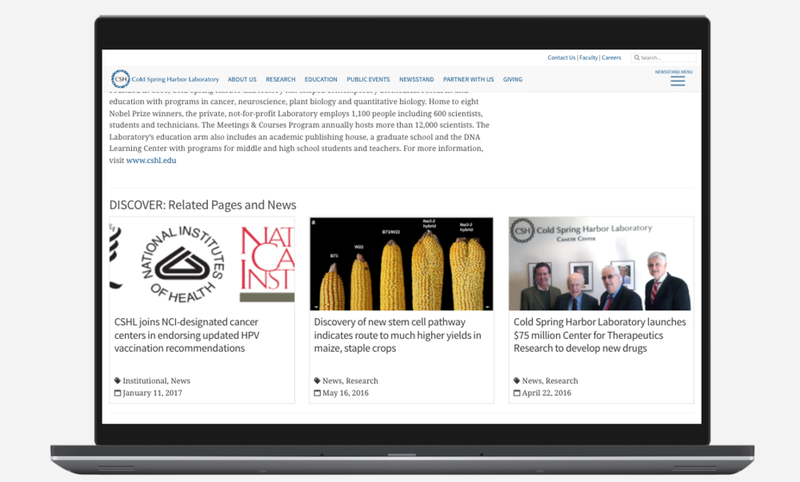 A leader in scientific discovery and biology education, CSHL retained AG Strategic to elevate its web practices, technology, design and teams to match the world-class status of this organization. CHSL engaged AG Strategic to conduct an assessment of our public website technologies and practices, with a specific interest in content management, custom web content, and how well it was positioned for future growth and flexibility and a strategic responsive redesign. AG Strategic, on three separate visits, conducted extensive interviews with division directors, stakeholders, and senior leadership. In addition, we analyzed a disparate set of content management approaches -- ranging from PERL to .NET to PHP on both IIS and the LAMP stack. Additional outside informants at colleges, universities, and top tier peer research organizations helped establish a baseline for best practices. After thorough background research, AG Strategic prepared a sourced 34-page report, Executive Summary and extensive high-level presentation for CSHL President Bruce Stillman. AG Strategic’s findings will be used to plan for the creation of a new web team to implement lean and agile development processes and embark on a phased multi-year plan to harmonize web design across divisions using a responsive approach. AG Strategic’s report also detailed some best-fit recommendations for open-source CMS implementations, based on internal staff skillsets and internal culture. AG Strategic's recommendations will be used to support the implementation of industry-leading backend solutions to support CSHL's web presence. A previous website redesign for a leading children's hospital had partially implemented a responsive approach by using tables for layout, thus limiting use of CSS frameworks that use modern grid-based layout approaches. AG Strategic was retained to responsively redesign the site under a modern framework and manage the implementation. Efficiently manage the web production of a responsive redesign framework for the site. Create a modular, modern CSS framework to allow a variety of page layouts. Retain the existing top-level navigation structure. An online code repository and style guide for in-house developers to use during CMS integration. Fully functional bootstrap framework pages and custom styles that will be used to redesign the site for an upcoming campaign.